With the synthetic cheer of the twinkling fairy lights of Christmas in the dim and distant past, the long dark trek to springtime always feels like a brutally hard slog. The ground seems stark, barren and lifeless. Yet all the while beneath the surface plants and trees are quietly, imperceptibly getting ready to burst out from their winter buds. 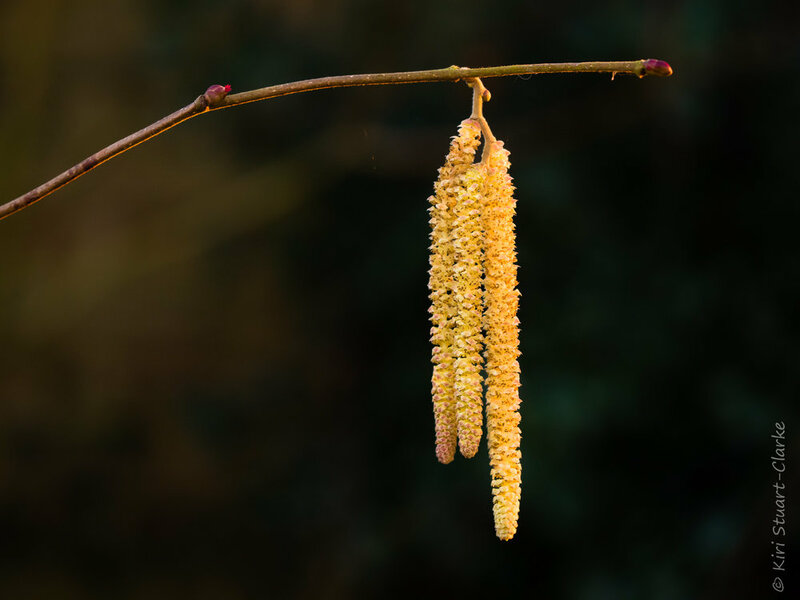 Catkins, male flowers of many common native shrubs and trees such as Hazel (Corylus avellana) and Birch trees (Betula pendula) are among the earliest augurs of that yearned for spring. 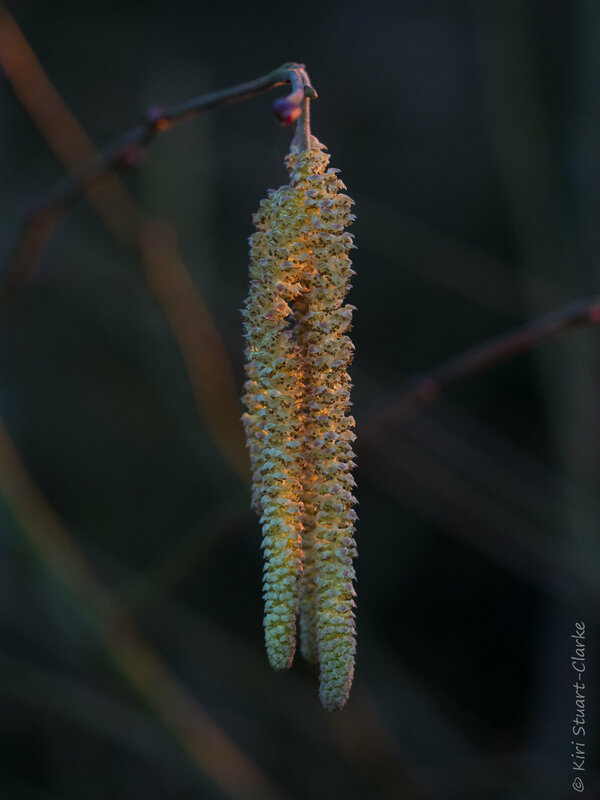 As the days rapidly lengthen, golden evenings start to appear, bathing the delicate, golden chains of late winter catkins in beautiful light. 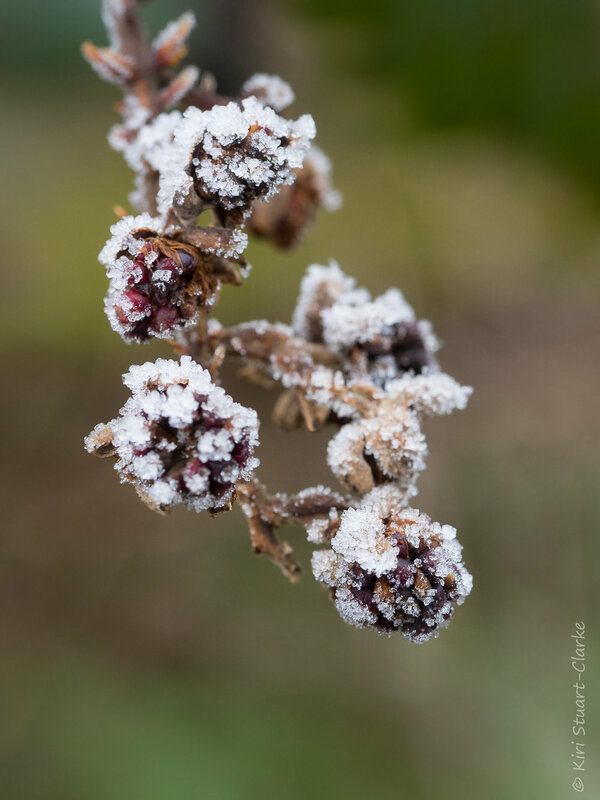 In contrast to the deep chill and bitter Beast from the East last year, winter 2019 has been remarkably mild. This February has even proven to be the warmest one on record thanks to a brief flurry of sunny mild days that heartened us all with a tantalising promise, however fleeting, of warmer days to come. One mild evening in mid-February I took advantage of the rich late afternoon light during our "fool's spring" to do a little study of the Hazel and Birch tree catkins in my garden. I learned that branches carry both male and female flowers with the male catkins emerging first. Hazel trees carry tiny little female red flowers that emerge soon after higher up the branch stem, whereas Birch trees have small, bright green, upward curving female catkins. Catkin pollen is intended to be windborne to pollinate other trees, there being so few insect pollinators about at the time of year, so it has evolved to have a self-repelling quality meaning that bees and other insects struggle to collect much of it, although it is a food source for them at a time of scarcity. Despite the luscious hue of light, the days rapidly turned back to chilly ones with even our fool’s spring warmth quickly forgotten. But soon, soon true Spring will burst forth in her lush green finery and the late winter gold fade out of memory. In past years, its been February before I've visited Hoe Rough to enjoy the snowdrops there out in force. But this year my first snowdrop sighting at one of my favourite, peaceful nature reserves was much earlier than usual, on the 16th January. Almost all the snowdrop plants were still quite stubby and offering just the tiniest glimpse of little furled up white buds, there were just 2 or 3 well positioned snowdrop clumps that had opened. So for the first time I captured the very first flush. In The Snowdrop and the Honeybee I explored the natural history and folklore of one of our earliest flowering wildflowers. Native or not, your heart can't help but lift when you first see Persephone's favourite little flower return from the depths of the underworld to a barren frosty landscape, reminding us that spring may not be as far away as it feels. Our mellow autumnal weather seems to be both treating and playing tricks on us this year. As mid October arrived I started to search for turning leaves and classic signs of Autumn, but in vain. 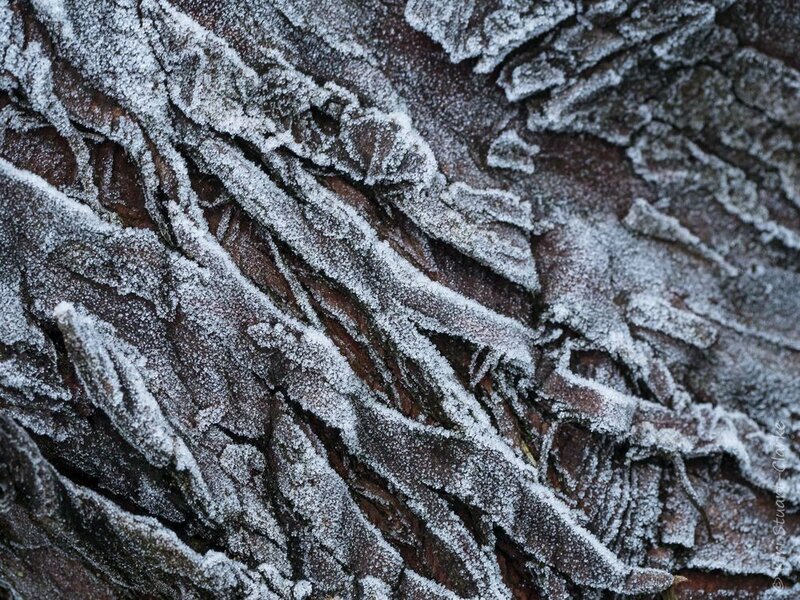 With such mild temperatures, the trees have determinedly held on to their cloaks of green as long as possible to maximise their intake of food. A Stroll in Blickling Estate at the start of half term week yielded some fallen leaves but the canopy was disappointingly still richly decked in a gown of glorious green, with only the occasional tree starting to offer up a hint of gold at the very top of their crowns. At last on a visit to Wells-Next-The-Sea at the end of the week, the mood had started to shift and begun to evoke a more autumnal tone. A gorgeously mild day, I watched several Red Admirals dancing brightly in the deceptively warm golden rays of the afternoon sun, but at last, I finally saw my first fully golden-gowned birch tree! Meanwhile, further along the pathway, a suitably russet-hued Common Darter dragonfly cast a long shadow as it perched on a fallen pine introducing rich red umber tones to the Autumnal palette. Phew! - our tardy Lady Autumn really has finally arrived with her gown of gold, just in time for the clocks to go back. By February we are all utterly weary of winter's leaden skies and lashing storms and desperately seeking those first subtle signs of spring, so it comes as no surprise that Common Snowdrops, or February's Fairmaid as they are sometimes called, are such popular flowers. It is a heavy heart indeed that could not be lifted by the sight of a milky white snowdrop flower head as it nods cheerily in the soft sunlight of a mild winter's day, or bravely peering through a late winter snowfall to earn their French name of "Pierce-neige" or Snow Piercer. There are about 20 species of Galanthus in all, with the name Galanthus nivalis stemming from the Greek gala and anthus "Milky flower" and the Latin nivalis meaning "Snow". Fond of damp woodland and watercourses, many people mistakenly believe that the Common Snowdrop is truly native to Britain or introduced in Roman times, but in fact snowdrops were first recorded in John Gerard's 1597 edition of "Great Herball" and were first documented in the wild only in the late 1770's. It is now believed Galanthus nivalis were first introduced into gardens in the late 1500's from Europe where their range spreads from the Pyrennees in the West to the Ukraine in the East. The "Flower of Hope" grew in popularity around the time of the Crimean War (1853-1856) when many soldiers returned with a new larger variety of the spring bulb, Galanthus plicatus, the Crimean Snowdrop, which bravely covered the battlefields despite the harsh winters to augur spring. Our love affair with these delicate yet incredibly tough spring flowers continued to grow and today snowdrops are one of the most widely traded bulbs in the world. Its long history in Europe and the UK means the humble Snowdrop is well established in folklore, literature and religion. The Snowdrop's strong Ecclesiastical associations are indicated in some of its alternative names such as Candlemas Bells, Mary's Taper and Eve's Tears. The snowdrop is a flower of contradictions. On the one hand, for Catholics Snowdrops symbolised hope and purity. Snowdrop garlands were traditionally used in the Candlemas procession on 2nd February celebrating the Purification of the Virgin Mary, which is one reason why they are so widespread along traditional routes to village churches. At the same time snowdrops also have a darker side to their folklore history. Perhaps owing to the flower's white shroud-like petals, Snowdrops have long been associated with death and bad luck. In Greek mythology Persephone or Kore, Queen of the Underworld and the goddess of vegetation, is said to have carried Snowdrops on her return from Hades in Spring. The snowdrops she carried brought back life to a barren, wintery landscape, but also carried strong negative connotations of the Underworld they came from. Also called Death's Flower, the Snowdrop became associated with death for many Victorians. According to superstition, seeing a lone Snowdrop was perceived as a portent of death and it was also meant to be unlucky to bring the first Snowdrop flower of the season inside a house. Whatever their origins and mythology, Snowdrops hold a deep and enduring place in our psyche signalling Spring, while for our overwintering wildlife, the sight of a Common Snowdrop is undoubtedly very lucky indeed and a massive boon at a time of great hardship and need. Their flowers provide a desperately needed source of nectar and pollen for early insects such as solitary bees emerging from hibernation, while their seedpods that also contain protein-rich elaiosomes are taken by ants and fed to their larvae. In so doing, the ants complete the circle of life by helping the Snowdrop plants disperse and start new colonies elsewhere. I enjoyed two dramatically different walks among birch trees within twenty four hours; my first a gloriously golden morning showing off Autumn's golden cloak in all its finery and then, courtesy of Storm Angus, a brief, soggy wind and rainswept excursion which made Litcham common feel very much like a blasted heath. A wet spring and mild autumn lacking the autumn storms we've had of late has enabled us to enjoy a glorious long-lived golden autumn foliage season this year. But with harsher, stormier weather approaching it may be time to say one last goodbye to autumn's rich vivid beauty and face the cold embrace of stark, hollow Winter, who, after lurking in the wings for a while and is now stretching out its dark frosty talons. Autumn seems to get later and later each year, perhaps a sign of the times in these days of global warming. The leaves here in Norfolk are only just colouring up, so to capture the mood of autumn here is a shot from my garden instead. It's a wild carrot seed head photographed against a backdrop of autumn flowering pink sedum in my butterfly and bee flower garden in gorgeous soft golden light we had yesterday afternoon before the clock change. Its been a "Staycation" holiday week for me, and when you are a little under the weather and even the weather's a little under the weather, then the soft golden light at the end of the day and pretty little signs of autumn in the hedgerows and country lanes always give me a lift. Here a few shots from an evening stroll along the Nar Valley Way. The local barn owl and muntjac deer made a few appearances too this week, though the owl remains camera shy.